I thought it would be fun to see what I’ve been talking about on Twitter. 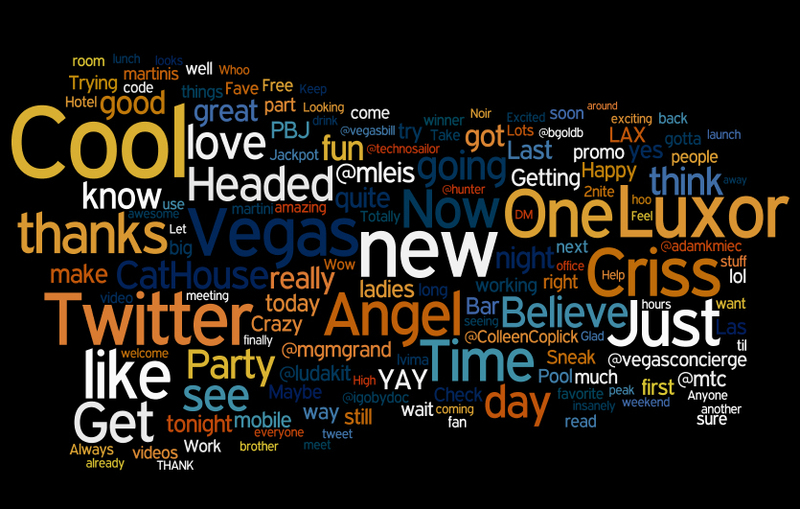 With the help of TweetScan and Wordle, below is a visual image (or tag cloud) of my last 500 tweets. This week, CES (Consumer Electronics Show) was in town. With it came a lot of Twitter folks like Chris Brogan, Justin Levy, Greg Verdino, Joesph Jaffe and more. A few days pre-show, I saw Chris Brogan’s tweet asking if anyone could help get him a picture of himself standing on the TI Pirate Ship for his pirate theme. Quickly, I replied to him saying, I’d try to help. Then, I went to work with PR to see if we could make it happen. Our PR team rocks. They get a multitude of calls and emails daily and sort through which requests make sense and which ones don’t. On the surface, Chris’s request doesn’t make too much sense. While he’s considered press (anyone who has a blog is), he doesn’t blog about Vegas. Moreover, he wasn’t using the picture to promote MGM MIRAGE, TI or the show the boat is used in, Sirens of TI. Honestly, I thought PR might reject the request and told Chris and Justin just that. However, PR is very supportive of our social media efforts and took that, as well as the fact that the request was coming from me (vs. an outside source) into account. 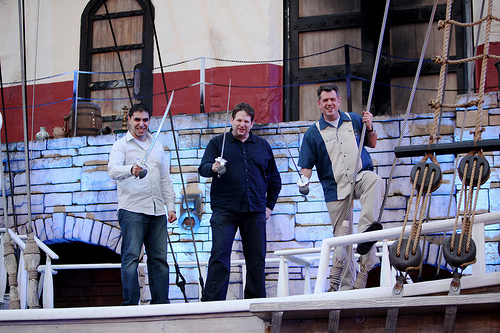 To everyone’s excitement, Chris and his “pirate crew” got to board the Pirate Ship, The Song (one of several pirate ships TI owns) on Friday, January 9, 2009. This article, new friends, a wonderful story about how brands can make a difference by using Social Media and being “human aware” and of course, the below picture. Yesterday, I did an interview with our internal PR guru, Craig. He recently started an all-company internal newsletter and wanted his next article to be about what MGM MIRAGE is doing in the Social Media space. Within ONE minute I had several responses. In less than five minutes, I had over 30 amazing responses! Craig was shocked and amazed. I could see his eyes light up and the light bulb go off. He got it. He understood the importance, the cool factor and the value of social media. In less than three minutes YOU were able to explain what I had been trying to explain for 30 minutes. To all those that responded to my question and helped out yesterday, THANK YOU. You are all truly amazing and special people… you ROCK MY SOCKS! Both personally and professionally, I’m a big fan of Twitter. The tool is great for listening, learning and connecting. Twitter Grader continues to improve and add new features. One feature they added was segmenting their “Twitter Elite” into cities, thus making it easier for more people to reach “Elite” Status. Well ladies and gentlemen, tonight, LuxorLV is officially part of the Las Vegas Twitter Elite! I even took a screenshot to prove it 🙂 I think this calls for a PB+J martini celebration!